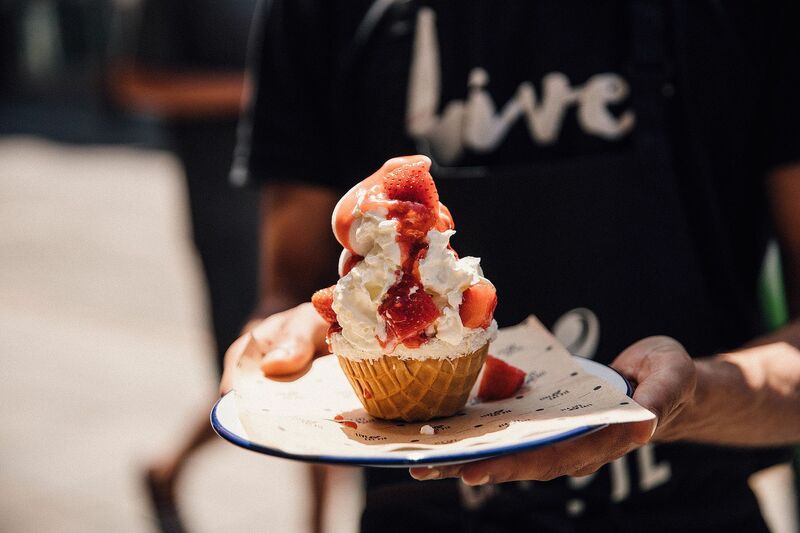 The perfect spot for your pie and mash fix in the city centre, Pieminister is branching out this summer and offering a new menu of soft-serve ice creams to complement its famous pies. Served in waffle-cone ‘pie-crusts’ and made with fresh organic British milk, the ice cream is thick, creamy and delicious. All pudding stomachs have been catered for this summer, with options including the ‘Honey Bee’ (frozen yoghurt, honeycomb, honey, pistachio and fig), the ‘Mud Pie’ (one for the chocoholics: chocolate ice cream, brownie and salted caramel), the ‘Pork Pie-scream’ (vanilla ice cream laced with free-range British bacon and Bourbon maple syrup, apple sauce and free-range British pork scratching) plus more here. Soft serve ice creams, to eat in or take away, start at £2.75. Sate that sweet tooth at Pieminister on Division Street and eat away the heatwave, courtesy of the family-run Bristol business. For Pieminister, life began at Glastonbury festival, when friends Jon and Tristan decided to open a pie shop of their own, having travelled around Australia sampling various pies along the way. Back in 2003, the pair started making pies in Bristol, using ethically-sourced ingredients and making sure that quality British produce remained a central part of the business. Today, the pair now run nine restaurants, six cafés, and their pies are available at various venues across the country. Sheffield’s very own Pieminister opened at 67 Division St back in March this year, and has since been serving up plenty of reyt good pies to the people of Sheffield. You’ll find the pie place ready for your lunchtime fix, and open until 9:30 and 10pm for tea and perhaps even a few cheeky after-work drinks. Now with its very own street-terrace, from 4pm, a more extensive menu kicks-in – why not add a cocktail or pint to your order (it’s two for one cocktails before 7pm and after 9.30pm during Happy Hour) - what about trying Pieminister’s very own ‘Pie.P.A’? Whatever you do in Sheffield after 5pm, make sure to follow #SheffAfter5 to stay in the loop on all things worth seeing/knowing/doing in the city centre this week.